Get a SMIRKY CAT PILLOW OR JUST THE COVER!!!! Links to my ETSY shop below! In this day and age, we need something to smile about!!! BUY A SMIRKY CAT ART PILLOW HERE! I am excited that I will be hanging my artwork up at http://satellite.communitytv.org/ on Soquel ave. for the Month of March starting with First Friday on the 1st of March. Check them out! Also I am creating my artwork on products like pillows, wallets and a few keychains! I found a very nice company based in the UK that is making these items for me. I wanted to create products that were more high end. Their fabrics and goods are nice so I am excited to be working with them! I just got in samples and will be photographing them up! I am so excited about my line of products with my Art work on them! When I decided to create products with my art on them, I wanted only very well made HIGH END products. I am starting out with a few items. Pillows, totes and wallets. Will be adding more items in time! You can SHOP here for items if you are in the US. This link only supports USA customers. If your outside the US, and want to purchase, Just shoot me an email (mackerilla@gmail.com) with the item your interested in and I can create an invoice for you. Examples of my pillows shown here. I have a positive quote on the backsides of my pillows. Pillows Art is sublimated into the velvety fabric for permanency. Pillow inserts are super lofty and comfy! You can choose a feather insert pad or a Polyfiber fill pad. Zipper pull is a sweet little metal heart! 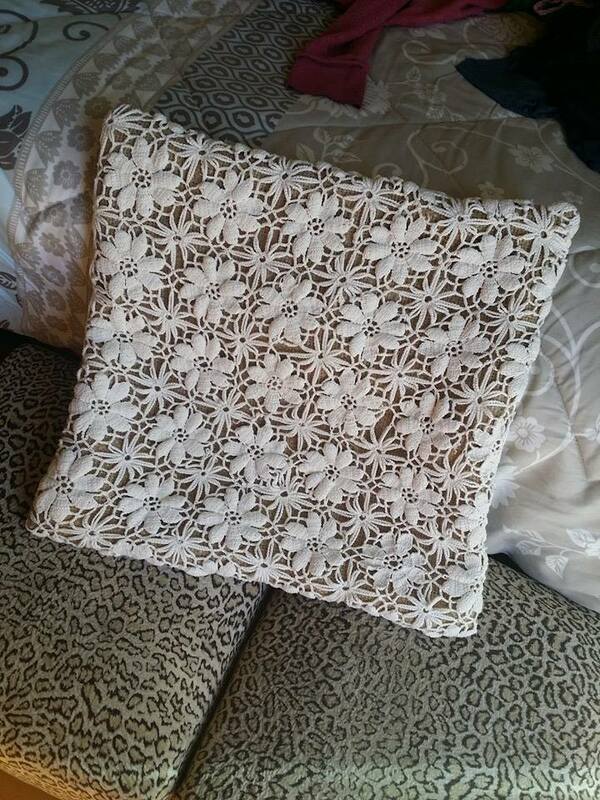 The stitching on these pillows are perfect! Fresh on ETSY some new Art pillows! These are high quality throw pillows I have made in the UK. I am so excited about these! Luxurious to the touch and comfy! Everyone needs a cute accent pillow!! Everything has a new life if needed. So I went to an estate sale yesterday where a 96 year old woman had seemingly lived her whole entire life in. Her children had passed away before her. Being sad, she spent lots of money on things she really did not need to fill the hole in her heart. Now she has passed and her belongings are moving on in life. Some of it junk, some never warn clothing and shoes. Lots of kitchenware, books and craft supplies. I found 2 old beautifully crocheted bed spreads/table covers. One was repairable with just having one small hole. The other was pretty ratty and stained. I am salvaging what is good on this and making some pillows. Utilizing the burlap coffee sacks I have acquired and covering the top with the cut pieces of the crochet blanket. At least I can give some new life to parts of something I believe she had handmade herself…….